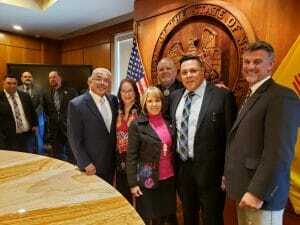 On March 27, sheet metal workers in New Mexico saw the culmination of years of effort when SB 143 was signed by Governor Michelle Lujan-Grisham. This legislation makes New Mexico the first state in the nation to ensure that fire and smoke dampers and smoke control systems are properly tested and inspected in accordance with National Fire Protection Association standards. These life-saving requirements will apply to public buildings, storage facilities and multifamily dwellings. In recent years, numerous localities and cities such as Cleveland, Pittsburgh and most recently Philadelphia have passed similar legislation. New Mexico sets a precedent by becoming the first state to do so.